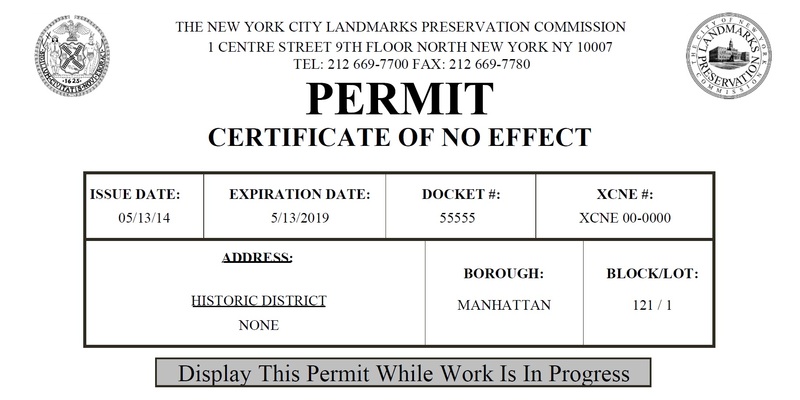 When the Landmark Preservation Commission (LPC) landmarks a building, permits are needed before starting renovations such as a window replacement. There are four different permit types you can obtain: a Certificate of No Effect, a Permit for Minor Work, a Certificate of Appropriateness, and Master Plans and Authorizations to Proceed. Let’s take a look at what differentiates these permit types. A Certificate of No Effect (CNE) is required when undergoing non-landmarked interior renovations or non-visible elevations. They are issued at staff level and, for a standard submittal, take up to 90 days to obtain. However, there is a fastrack program available that takes only 10 working days. These certificates don’t expire for 4 years. A Permit for Minor Work (PMW) is required for exterior work on visible elevations or “special windows” that adhere to Title 63. These are also issued at staff level and, on average, take around 70-80 days to obtain, but can take as long as 90 days. Like the CNE, this permit is valid for 4 years. A Certificate of Appropriateness (CofA) is for new construction or additions that do not adhere to Title 63. They are issued by Commissioners at a public hearing and, on average, take about 4 to 6 month to obtain. A CofA will stay good for 6 years, after which they expire and require a new issuing. The last permit type are Master Plans and Authorizations to Proceed (ATP). Master plans govern repetitive renovations that will not occur all at once, such as window replacement programs. They are generally issued at staff level via a PMW, and take around 3-5 months to obtain. While this is longer than other permits, Master Plans never expire and there is the option to streamline the process through an ATP, which only takes 20-30 days. On top of this, a master plan can dramatically reduce expediting costs by $2500!